When I submitted the final text for the Edgar Snow Project, I realized that I had not written about the exhibit items and how they would fit within the main text. I mentioned before that each item on the map would be linked to a word within the text. When we began the site last semester, each of us covered different years of Snow’s life so, naturally, there was some overlap between them. One challenge in this was figuring out where to place exhibit items in the rewritten text, especially where the years overlapped. I also wanted to make sure to highlight some of the most important events in Snow’s life which were listed in a pamphlet from the Missouri State Historical Society. If it sounds confusing right now, believe me, it was even more confusing trying to sort it out in my head. My solution to this was to print out the entire, unedited text from all five sections and come up with a system for keeping everything straight. These are two of the ten pages I worked through. The blue words represent the significant points in Edgar Snow’s life from the pamphlet mentioned earlier and the pink words represent website links that were in the original sections. I also wrote notes on how to rewrite the text and included some info on the “slugs” for the HTML (which I’ll talk about soon). I know it looks like a confusing mess, but it made perfect sense to me, somehow. 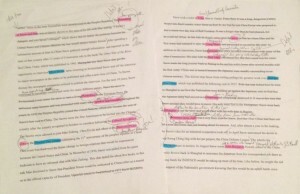 In the end, I had over ten printed pages which had multiple colors and notes. This is a perfect example of how something that looks so chaotic could actually be very organized and, if we are going by this article, my messy work habits might have some benefits. Maybe. This entry was posted in HistoryMaking and tagged digitalhistory, edgarsnowproject, public history on December 23, 2014 by Autumn Neal.